Over at the Irrational Games' Blog, the BioShock Infinite developer has posted concept art and documents from an old, abandoned game called Dungeon Duel. The game had made it all the way to development back in 2002, based off of a pitch that described it as a "fast-paced RTS strategy with the addictiveness of card game trading in a unique fantasy setting–a true RTS game built specifically with consoles and their controllers in mind." The post includes a collection of concept art and screen mockups, and even the game's entire concept document as a PDF. 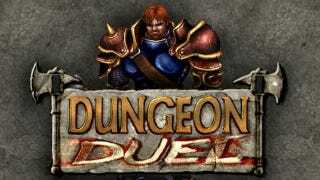 Had it been made, Dungeon Duel would have included unlockable "expansion packs," randomly generated dungeons, good and evil campaign modes, and multiplayer modes like Duel, Capture the Flag, "Dungeon Ball," "King Killer," and Last Man Standing. BioShock: Infinite creative director Ken Levine would have been assuming that same role in Dungeon Duel, along with current Irrational Games art director Nate Wells, lead artist Shawn Robertson, and concept artist Robb Waters. Time is limited and resources are finite, and so all game development studios can only make a certain number of games. But it's fun to read about Dungeon Duel and wonder what could have been. And who knows? Given that we've seen some textures from another unfinished Irrational game in Bioshock: Infinite already, maybe a late-game scene will feature Elizabeth and Booker engaging in some good ol' card-trading. Stranger things have happened.